Dr. Peter Larose was before the National Assembly on Wednesday to interact with the Honorable Members to answer questions following his nomination as a cabinet minister. It is common knowledge that Dr. Larose’s forte is in the field of finance and banking. 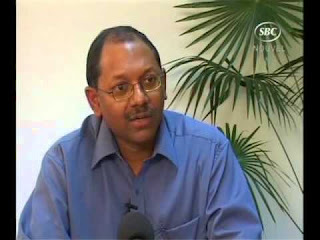 Following a question from Jean-Francois Ferrari Dr. Larose acknowledged that 50 million American dollars was transferred as a grant to the Central Bank for the Seychelles government from the UAE authority. He also stated that this money was transferred back to an account overseas in the name of a local parastatal company. Ahmed Afif decided to press Dr. Larose for specifications in an attempt to play cheap politics. Dr. Peter Larose reminded Ahmed Afif rightly of the fact that he too was in government at the time and he (Afif) kept quiet about this issue as well. The corrupt nature of Ahmed Afif rose to the surface when he lied to the National Assembly and to nation on Wednesday by stating that he was told that the money had come in as an error and it was being returned. This is the first time that Afif has said this - in fact in the last twelve months Afif has been shouting the loudest about the 50 million dollars when all the time he knew it was an “error”. Ahmed Afif is as corrupt as those he left in government he remained silent over the issue when he was in government to protect his position he couldn’t care less about the national interest. He is only speaking out now because he lost his job and the privileges that is associated with being principal secretary of finance. He is corrupt and he needs to be investigated like all of them for corruption. (1) Ahmed Afif have you ever lied to the Seselwa when you were Principal Secretary for Finance – when you said many times there were no corruption in government? (2) Ahmed Afif did you lie when you also helped defend and cover up the loss of 4.5 million dollars intended for the housing project at Perseverance? (3) Ahmed Afif can you confirm or deny the allegation that foreign exchange confiscated by the currency police was given to you directly? (4) Ahmed Afif did you apply for a duty free vehicle, namely a Ford Ranger (s5318) in February 2005 on the basis that you are a handicapped person? (5) Ahmed Afif can you tell us what you know about the consultancy firm ‘White Oak’, who hired this company and how much was paid to them and for how long? (6) Mr. Ahmed Afif during your employment with this “corrupt” government have you ever asked a supplier for Health Supplies for a commission of Euro 50,000 saying that it was for your superiors, “pour mes superieurs”? (7) Ahmed Afif will you be prepared to appear before the Corruption Commission when it is finally set up? (8) Ahmed why did you stay quiet over the 50 million USD and what part if any did you play in allowing it to leave the country? (9) Ahmed was it you who authorized the transfer of that money to a branch of the Bank of Baroda in the UK on the request of France Albert Rene? (10) Ahmed can you explain under what circumstances that your wife was able to acquire two plots of land from government?